What does FAA/ARW stand for? FAA/ARW stands for "Federal Aviation Administration/Aviation Requirements - Weather Group"
How to abbreviate "Federal Aviation Administration/Aviation Requirements - Weather Group"? What is the meaning of FAA/ARW abbreviation? 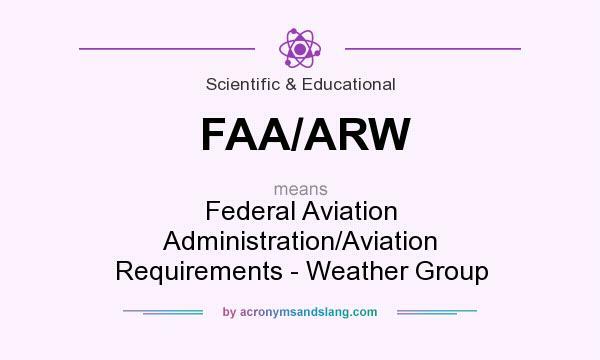 The meaning of FAA/ARW abbreviation is "Federal Aviation Administration/Aviation Requirements - Weather Group"
FAA/ARW as abbreviation means "Federal Aviation Administration/Aviation Requirements - Weather Group"